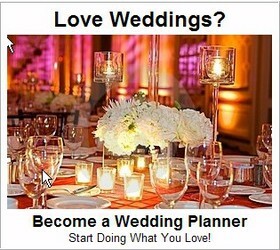 Answer: Oh YES, we DO have Harley Wedding ideas! And many of our visitors who have had Harley weddings have contributed their Harley Wedding ideas too! Read below to see a ton of Harley theme wedding ideas! What comes to mind is to incorporate a Harley motor-bike cake topper. I’ve seen them before – check around and you’ll probably find one. The one’s I’ve seen are really cute, with a little bride and groom riding the motorbike. Also, I’m hearing “born to be wild” (by Steppenwolf) playing at this wedding, possibly when you and your bridal party are announced as you enter the reception. It sounds like its going to be a really memorable and fun wedding! ~I thought that my bridesmaids would walk down the aisle to “Leather And Lace” by Stevie Nicks. I am having two flower girls and I thought that it would be different if they both wore a pair of angel wings. Since it’s hard to find invitations that I like with the Harley theme, I am designing those myself; along with my save-the-dates ,and wedding programs. Any ideas you can think of also would be great. Thanks. ~ Harley Wedding Guest Book Idea – Instead of the standard guest book, take an old riders vest, helmet or other personal item and have guests sign the vest with silver metallic pen. Frame it in a shadow box. ~ I am planning a biker wedding and geez it’s a whole lot harder than I thought it would be. I made my own invitations, I bought the kit at walmart(17$ for a set of 50 with reply cards and envolopes) and found a picture I liked that represented Harley Davidson and a wedding. They turned out great. .
~ We too are planning a Harley wedding theme; it will be outdoors so we are having a pig roast corn,salads,etc. We are to have the wedding party drive up on bikes, then after we exchange vows we all are going for aride around town then back! ~ I am also having a Harley/ Biker themed wedding. I found a awesome cake, three tiers, with icing that looks like leather. I went to the local Harley dealer and got chrome decals for the sides of the cake. Also Biker Bobble Heads for the table – really fun way to decorate the reception tables. The colors are Red, Silver and Black. For cake toppers I am using one of the groom’s favorite Harley collectibles. Wish me luck! ~ There are some beautiful Harley wedding flowers on e-bay. They are very elegant and it goes to show any wedding can be tastefully done. ~ I’m also planning a biker wedding for next year! I just want to say thanks to everyone on here!! I’ve gotten some really great ideas that I’ve already shown to my hubby (we’re renewing our vows) and he LOVES them!!! ~ I just had a “Harley” wedding. We held it at our favorite biker bar that we go to every weekend. Everyone wore Harley t-shirts and jeans, NO DRESSES. My cake was made by my best friend. I know this sounds weird but for cake decorations I went to Hobby Lobby in the scrapbook section. They had tons of metal Harley items for scrap books that really made the cake look great. 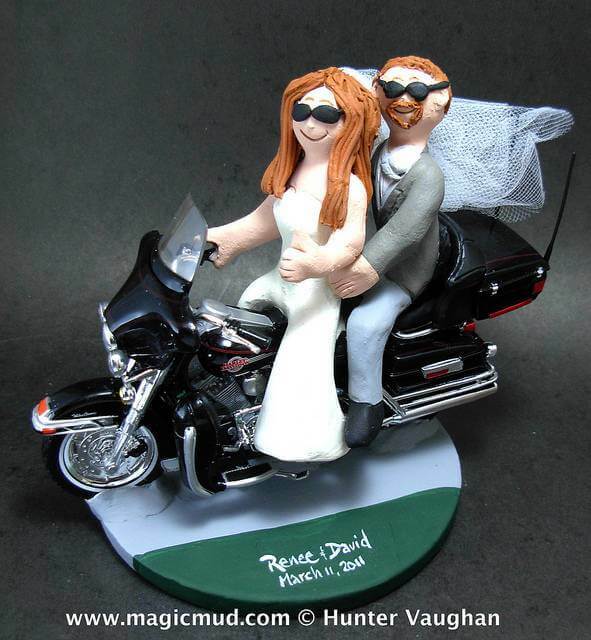 I also have a great friend who picked up a Heritage softail wedding cake topper at a Harley shop in Iowa. My bouquet, garter and headdress were hand made by the same lady who did the cake. We then had a live band play at our home for the reception and it was great. It was a somewhat non-traditional wedding in the home, but it was really “us” and I wouldn’t change a thing. ~ Ideas for Harley Wedding – My husband and I were recently married at a Harley Davidson Dealer. The site was a gorgeous park like setting with some old buildings and an old wagon. Just goes to show, you can come up with some really fabulous reception venues, if you are creative in your thinking. We put up a decorated arch and rented a tent and chairs. We had food catered in (bbq pork loin, green beans, 7 layer salad, au grautin potatoes, homemade rolls, drinks). A local grocery store decorated a gorgeous cake for us in Harley Theme colors. We decorated each table with a floral centerpiece of white calla lily, orange roses and black roses with baby’s breath and other fillers that were awesome. We used glass vases filled with clear glass beads and small black rocks in the vase for the main table. We used a lot of tulle to decorate chairs, etc. I bought 3 large orange plastic tubs and filled them with ice and all sorts of drinks. There were picnic tables outside of our tent and we decorated each one with a fresh floral centerpiece from our local Lowes. I had a cake/knife server decorated with black bows and little Motorcycle charms; a bridal doo rag, custom made. My wedding dress was tea length, altered in the back with black loops and a black ribbon lace up tie. My husband wore a white HD shirt, black HD leather bow tie and he looked awesome! Oh, our favors were lottery tickets inside of lottery envelopes with a penny included for scratch off in each one. ~ I am loving the wedding cake! I’m planning our biker wedding and need ideas for my wedding to my biker guy, Greg. We are from Wisconsin. My wedding is due to be an evening candle light event with my dress being a black tea length; my colors will be black, ruby, and some white (veil, flowers, etc.) with a crystal and chain look in the accessories as well. ~ Harley Wedding Invitations. I need some help. I am helping my husbands aunt with her Harley Davidson wedding invitations and I was wondering if anyone had any ideas. I read in any earlier post that some one was using the Harley logo and replacing the wording of the original logo with his and her name. I think that is cool but how is that done? Is there a software to do that or is it simple cut and paste. I am pretty good with the computer but haven’t been able to figure that one out. Help someone! 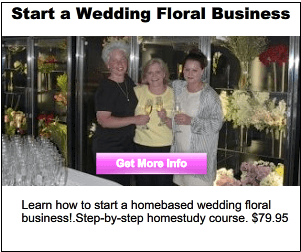 ~ Wedding DooRags – I accidentally came upon this site and have read all the comments on Harley Weddings. Lot of clever ideas. I am a seamstress and would like to make a really cool doorag head piece. Just ideas in my head right now but would like to try one. ~ Wedding ideals for bikers – I am a Rider myself and have loved some of the ideas here. Just wanted to let you girls know of a place to get invites if you want to customize, Rexcraft. They took a picture I sent them of my bike, and my mans bike… put it on the front of the invitation I chose (lots of choices… lots of prices). It was really simple, unlike a lot of others i looked at. ~ I’m having a June Harley wedding and I have most everything done but need to get the DJ a list of songs to play for the ceremony; we really don’t want traditional songs. Any ideas? ~ What I have planned for my Harley wedding: As for my Invitations, we took the bar and shield and put the date of the wedding on the top our names in the middle and the word forever on the bottom of the shield. A picture of a motorcycle is in the back ground, then we have a sticker of the bar and shield to keep invitations closed. We also customized our stamps – you can order form Stamps.com. My sister did my invitations but I think she only used a simple Microsoft Office program. For wedding favors I got a motorcycle candy mold and we made chocolate candies. Then my uncle was able to make floating candles for the center pieces. The men have Harley shirts and black cargo pants; the girls have a simple black dress. I have a wedding gown that is pretty simple. We are having an outside hog roast. ~ Biker Weddings – I too am having a biker wedding. We have chosen to have a outside wedding and are making it a weekend long event with all our biker friends. We have planned on having the ceremony under huge oaks that I grew up under. We will have a aisle of motorcycles and the groom standing next to his bike at the altar. The best man will ride down and park next to him and stand next to his bike. Then the maid of honor with the next groomsmen will ride down and park on the brides side of the altar, she will stand next to his bike and he will walk over and stand on the other side of the best man’s bike. Same thing for the next two bridesmaids and groomsmen. This will leave three bikes on the bride’s side, and two on the grooms. My dad will ride me down the aisle on his bike and park next to the best man’s bike. Giving us three on each side. After the ceremony we will all saddle up and ride bike down the aisle being followed by the aisle of bikes itself. Our colors are a French (kinda mauve) pink , black and med grey. The groom’s men will wear medium gray mechanic shirts that we are having embroidered with their names over the pockets and their title as members of our wedding party under the names. For the bridesmaids, the same on the pink. I have a friend that makes vinyl signs and is making the table cloths with the bar and shield, and our names and wedding date. Having a classic rock n’ roll band, we’ve rented a dance floor and the reception will be BBQ catered. Hope this helps others planning a biker wedding. There really is not enough info on the web about it. ~ I have done some research since my last post. We have decided to have the wedding ceremony in a park. The groom will arrive on his bike as will some of the groomsmen. Myself and the bridesmaids will arrive in classic cars. The ring bearers will ride up the aisle on their pedal bikes. I will be wearing a simple a-line white gown. My boots will be fashion Harley Davidson boots. The groom will be in new riding gear (jeans, boots, shirt, jacket). Groomsmen in black jeans, black boots, matching Harley shirts (smaller version for the ring bearers). The bridesmaids will be in matching cocktail length black dresses. ~ We are doing a Harley wedding for my daughter. We are taking the guest book, pen, bride and groom glasses and redoing them, using a Harley charm. We are making the centerpieces for the tables ourselves that matches the guest book. At first I wasn’t very thrilled with the idea of a Harley wedding for my daughter, but I have found this to be a very fun project, really puts you to thinking creatively. ~ Wow, I had no idea there were so many interested in the Harley theme wedding. I am getting married and ours too will be Harley themed. I thought I was in this thing by myself… I was amazed at the great ideas I have seen on this site. I would love to find a floor-length black leather dress. The guys will be wearing jeans, orange t-shirts and black leather vests; girls… not so sure yet. I have a friend making me a Harley cake but would like to find favors, cake topper, guest book etc. ~ I just became engaged 2 days ago and we both ride and would love to incorporate both bikes in the wedding. 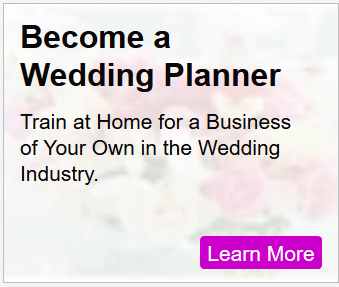 We don”t live fancy, I don’t want fancy, but would like a beautiful Wedding day to remember. ~ Motorcycle Wedding – its cool riding to a ceremony with a priest following you on the back of a bike. That’s what we’re doing. Fortunately we have a very cool priest – they won’t all go for this! ~ What a cool wedding theme idea! I love the picture of that Harley themed wedding cake! I love some of the ideas on here. Sounds fun! Who Sits at the Head Table at the Wedding Reception? I really want to buy this particular wedding cake topper! Anyone know where I can buy it? Sorry, don’t know the source, but glad we were able to inspire you with an idea you like!